Business Advantage is the course for tomorrow's business leaders. 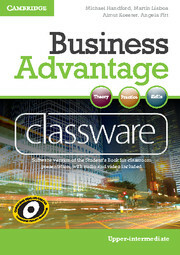 Business Advantage Upper-intermediate Classware is presentational software for the classroom, to be used with interactive whiteboards of all sorts (including portable devices) or just with a projector and a computer. It brings together all the core content of the course into a single platform, allowing immediate access to key resources. It facilitates the integration of teachers' own content with the course resources and other Classware products. Notes and media files can be added and saved in preparation for lessons, and the toolset enables annotation of all course texts and images.